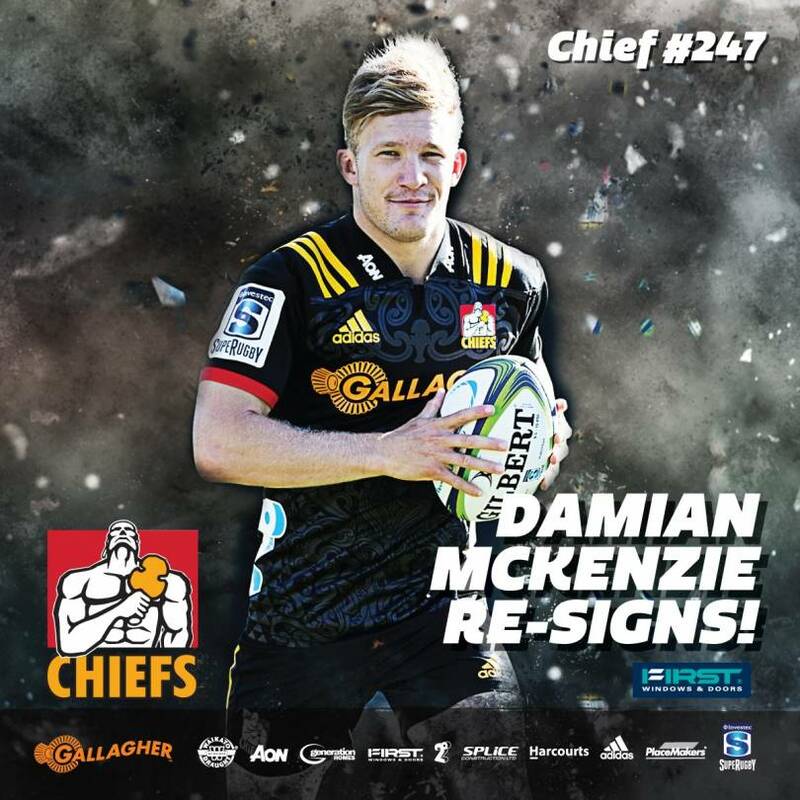 Fan-favourite Damian McKenzie has re-signed with the Gallagher Chiefs, extending his contract with New Zealand Rugby and the Chiefs Rugby Club for a further three years until the end of 2021. Gallagher Chiefs head coach Colin Cooper was delighted to be able to continue to work with Damian. Damian was excited to sign on for the next three years in New Zealand. The 22-year old has 52 Chiefs caps, making his debut in 2015 against the Blues. Damian is adored by the fans everywhere he goes and is a proud ambassador for First Windows & Doors, one of the Chiefs Rugby Club’s major sponsor partners. Damian has gone from strength to strength in Chiefs colours, lighting up the competition with his majestical runs, and becoming one of the true standout players in Investec Super Rugby. In 2016 his stellar form was rewarded where he was given the black jersey in Buenos Aires to take on Argentina. The versatile back has constantly excelled on the field, and has taken extra responsibility with the goal kicking duties which he’s thrived at. 2017 was a landmark year in McKenzie’s career. Outstanding performances in Investec Super Rugby resulted in him winning Coaches Player of the Year at the 2017 Chiefs Awards, and Damian went on to be a prominent figure in the All Blacks camp, earning 10 caps throughout the International season. He also featured at First Five Eighth for the Maori All Blacks against the British & Irish Lions in June. The impressive playmaker has numerous individual accolades to his name, including winning the 2017 New Zealand Age Group Player of the Year at the 2014 Steinlager Rugby Awards, as well as Waikato Emerging Representative of the Year in 2014 and Waikato Sportsman of the Year in 2017.